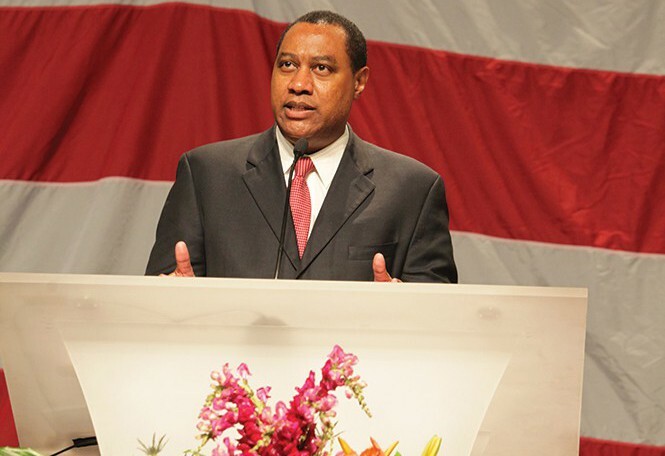 A long-standing feud between Utah State Sen. Todd Weiler, R-Woods Cross, and Utah Republican Party Chairman James Evans may have finally reached a tipping point, as Evans told City Weekly this week that Weiler has been calling party donors and telling them not to give any more money while Evans is chairman. Weiler strongly disputes the allegation. "I've never once called any donor and told them not to donate. In fact, there's a chair in the Republican Party headquarters with my name on the back of it because of how much I've donated to the party myself. ... These tactics are just ridiculous. I would love to see him name that donor [making the claim]." Evans declined to provide the names of these donors for City Weekly. "I'm making the claims. Todd can refute it all he wants. But I'm not going to drag them into the middle of this," Evans says. "I'm just baffled why Todd continues to attack the party and seems to have such a negative narrative," says Evans. He says donors had called him to ask why Weiler was telling them not to give money to the party. "I've complained repeatedly at meetings that there was an elected official who contacted our donors and asked them not to give to the party, but I've never said who it was. But now, I'm deciding to say, 'enough.' It was Todd Weiler. He seems to have this pattern of doing everything he can to harm the party. He just doesn't stop." Weiler says Evans isn't releasing the name because the claim is a fiction. "There is no donor. The name doesn't exist," he says. James has "the worst job in politics—an unpaid position, I might add," he says, "and I have a lot of sympathy for him. ... James has gotten the party to where it needs to be. He's moved mountains and worked miracles. I take issue with the way he got us here, but he got us here, and I give him credit for that." However, Weiler says, "I'm not his therapist, but I think James likes to portray himself as a victim." 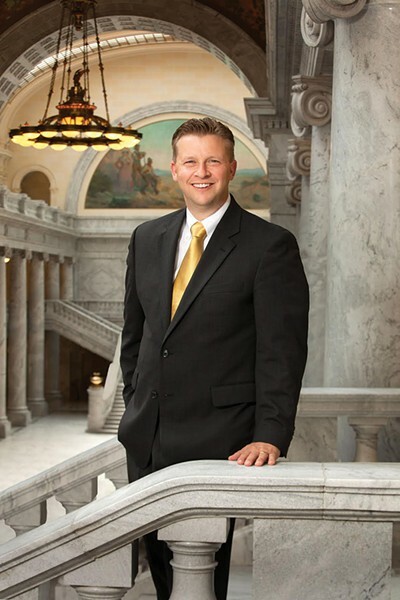 When Evans first ran for chairman of the Utah Republican Party in 2013, Weiler endorsed him for the position. "I was proud to stand next to him that day, and I still consider him a friend," says Weiler. But things between the two grew tense, as did tensions between the Republic delegates and lawmakers, in the spring of 2014, when the Utah Legislature passed Senate Bill 54. The election-reform law created a compromise between the Republican Party's desire to stick with the caucus-convention system and the Count My Vote (CMV) initiative that would create a direct primary (allowing Utah's 650,000 unaffiliated voters to participate in the primary election of their choice). Now that SB54 is law, candidates can take either the convention or signature-gathering route to get their names on the ballot. The compromise did not sit well with Republican Party leaders and delegates, and Evans filed a lawsuit in late 2014 to have the law overturned. In previous interviews about the lawsuit, Evans questioned whether or not the state should have a say in how private organizations choose their candidates. Over the months that followed, the spat between Weiler and Evans became more constant in press interviews and on social media. On April 20, the GOP's official Twitter account sent out a tweet: "It's sad that [Weiler] chooses to attack [the Republican Party] instead of assisting." "I'm sorry—what did I get wrong?" Weiler tweeted back. Weiler takes exception to what he calls "being turned into the bad guy," when he says the Legislature was simply acting to protect the caucus-convention system however it could. "Once Mitt Romney endorsed [CMV], we felt it was inevitable that it would pass, so we had to do something," says Weiler. That sentiment was shared by many of Weiler's Republican colleagues in the Legislature, including then-Rep. Jon Cox, R-Ephraim, who, in an op-ed on UtahPolicy.com wrote, "All of my colleagues who supported SB 54 honestly believed the CMV initiative would pass and the [caucus-convention system] would be gone ... probably forever." Evans, on the other hand, called SB 54 a "travesty" at a press conference discussing the party's lawsuit, and an infringement on the party's rights. The rift seemed to grow deeper earlier this year when Evans announced a proposal that the party institute an interview process for candidates, so the party could control which candidates would be allowed to list themselves as Republicans on the ballot. The new proposal was not implemented, but it would have compelled Republican candidates choosing either the caucus-convention route or the petition route to sit for a "star-chamber" type of interview with a few high-ranking members of the Republican Party, with each candidate being questioned about where they stand on the party's issues. They would also have been required to pay a $10,000 fee. If candidates refused the interview or the fee, they would not be allowed to identify themselves as Republicans on the ballot. At the time, Evans said that if the party didn't require Republican candidates to go through this interview, "there's absolutely no requirement that they'd have to interact with the party whatsoever, and you might have Democrats running as Republicans. This is about controlling the Republican brand." Weiler quickly dubbed the interviews "PPIs" on Twitter, a reference to the LDS Church's practice of Personal Priesthood Interviews, in which each church member meets with local leaders, who determine whether or not the member is worthy to enter LDS temples. In a heated April 2015 debate aired on KVNU 610 AM's For the People radio show in Logan, Evans accused Weiler of misrepresenting him and the proposal. "It's a constant twisting, a twisting of what we're doing," Evans told Weiler and listeners. "We are simply trying to compel behavior by defining our membership." "It's the voters who should decide [candidates'] worthiness," Weiler fired back, "not the party." "This whole concept just stinks of exclusiveness," added Paul Mero, former president of the the conservative Sutherland Institute who was co-hosting the show with radio host Jason Williams that day. "And it just tells me what happens when ideologues try to do anything." "I just can't understand this idea that the Republican Party is suing the Republican Legislature and the Republican governor for enacting a law that protects the Republican Party," Weiler said in a recent interview with City Weekly. "It's insane." But things may have finally reached a tipping point in August at the Republican State Convention. On the ballot were four proposals—three of which involved bringing the party into compliance with SB 54 (although the lawsuit will continue moving forward, says Evans). After Evans made the initial presentation, Weiler and others spoke in opposition to the proposal that would give the Republican Central Committee the power to determine party membership. Weiler says while he is in favor of candidates signing disclosure statements so voters know where they stand on issues, he fears that allowing the Central Committee to make alterations to membership requirements at any time concentrates too much power in the committee's hands. "Instead of leaving the decisions [on membership] to the 4,000 state delegates," says Weiler, "that power now goes to 180 Central Committee members, [giving them] a blank check." Weiler himself is a member of the committee, but since not all 180 members show up to each meeting, it means that some committee decisions are passed by only a handful of people. Some votes require a simple majority of those present; others require a two-thirds majority. Thus, any major decision about who can or cannot identify as a Republican on the ballot could be decided by a small number of committee members. "They could easily say, 'OK, anyone who votes in favor of [Governor Herbert's] Healthy Utah is no longer a Republican,' and start excommunicating Republicans when they're up for re-election." The day after the convention, Weiler tweeted a list of "Top 10 disturbing things" about the convention. Of the 10, six involved Evans' treatment of the proposals. "Parliamentary procedure was ignored and abused at the chair's pleasure," wrote Weiler, who pointed to an hour-long conference call for delegates before the convention where Evans spent time advocating for the proposals. Weiler also tweeted his objection to Evans using personal time as chair to rebut every person who spoke against the proposals. Evans says his comments weren't intended as rebuttals. "I was simply trying to clarify the misrepresentations being made about the proposals, which I'm absolutely allowed to do under our bylaws," he says. Tim Chambless, a professor of political science at the University of Utah who is also affiliated with the U's Hinckley Institute of Politics, says he's not surprised that the feud between Evans and Weiler is ongoing. "You've got to look at the calendar. In about six months, there will be the caucus meetings for candidates and those who want to be candidates through the caucus-convention system, and we've got a number of statewide offices up for election, the presidential race, and especially that Senate race with Mike Lee. So, you can fairly say that there's a relationship between the struggles over the status of SB54, and that's politics. They're looking ahead to 2016. "The Republican Party is the dominant party in the state," says Chambless. "And when you have such a large party, you're going to have many differences of opinion within their membership. A party that tries to stand for everything is going to have many dissident voices." Chambless says it's "foggy" as to whether the feud or even SB54 itself will have much effect on voters next year, but he says he believes that the Evans/Weiler feud has become very personal. So will the face-off between two senior Republicans continue, or can the rift be healed? "Politics is all about relationships," Chambless says. "It's also about power and getting what you want from the public-policy process. You can have good relationships by doing what James Madison said, 'Compromise, compromise, compromise,' and you can also have political feuds. The Democratic Party has them as well, but in Utah the Republican Party is far more likely to have feuds and have matters taken personally, because they have all the power."